LED light: CREE XM-L Q5. The Flashlight with zoomable function to adjust brightness. CREE XM-L Q5 1000 Lumens waterproof flashlight, be made of aluminum alloy, has a very solid construction. 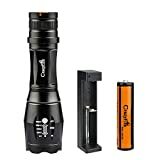 Powered by 1x rechargeable 18650 battery or 3 x AA batteries. Package includes 1 x charger and 1 x 18650 battery. Wide application for indoor and outdoor activities, such as hiking, hunting, camping, fishing, walking dogs or home use.